I have had a few games with Rahn already. Tho every game has ended up with an assassination, I felt that I would like to try the attrition game. Through the game, I couldn't help but thinking what were Privateer Press thinking. When they introduced pre measuring. Also my mind kept drifting off towards all the ways I could get hold of Cain 2. We were playing the scenario, Entrenched. Rahn won the dice roll, and opted to go first. Cain saw a few opportunities with the terrain. Forest, a hill and the house would give his army good protective opportunities. The picture is from after Retribution first turn. Retribution runs up straight up. Ending up very close to what starting deployment looked like. Just remembering to keep my HSBM behind Helios, and trying to keep all models that are in Cain`s threat range spread. Both Chimeras get three focus, to try to keep them safe. The one closest to Cain, behind a wall, and the second out of his range, but safe for the rest of Cain`s shooting. 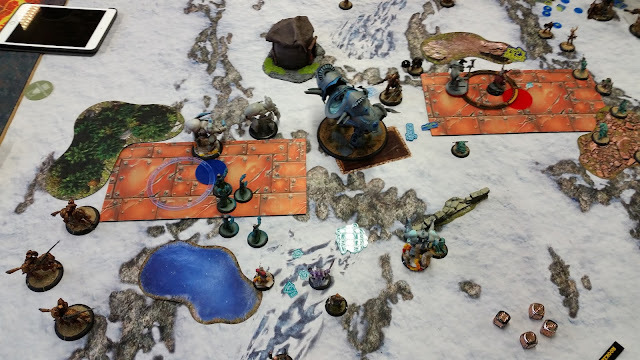 Cygnar runs up. 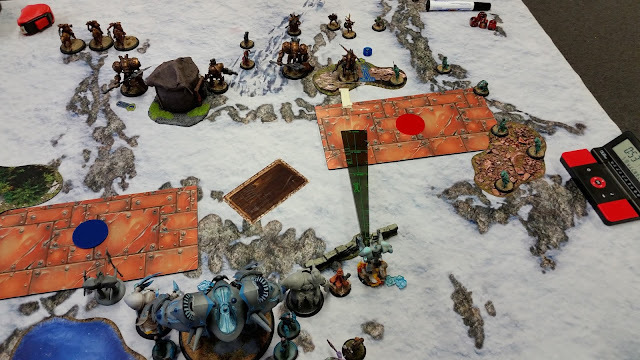 With a loss, and Rahn`s huge assassination range fresh in mind. Cain tries to stand as safe as he can. This hurts Cain in my opinion. Since he gives me half the table, and ends up using Ace stealth og a hill, with heightened reflexes on. Round two is a blur for me, I messed up my plan badly. Then plan was to telekinesis the furthest left jack in. And kill some rangers to the right. I wanted to clear out the left side of the table to move R into the zone, and not let Cain get ahead on controll points. I managed to telekinesis the jack, and the telekinesis my own Chimera behind the forest terrain. To keep him safe from the cavalry standing in the back. From there I moved my Sphinx up to shoot the Centurion, for psychic relay. And started moving my HSBM within range of the Centurion. This is when I realized that I forgot to cast Chain blast on the Rangers. I pulled the Centurion close enough, and then in place. So that I could walk up with Helios, shoot him, and then melee him to death. Nevertheless all the mistakes, I managed to kill the Centurion, start the game 17 points ahead of Cygnar. Cygnar shuffles around, trying to minimize his losses. But still getting the most out of his turn. Cain moves into place, getting a few shots in to the furthermost Chimera to the right. Taking out everything but both arms. Because I made so many mistakes round to, Cain also got my Magister and Lanysa. 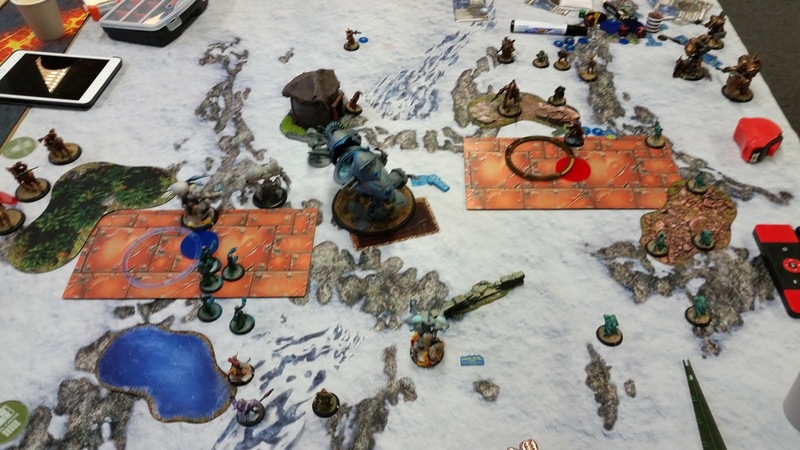 Cygnar scores one control point. Mistakes were made on Cygnars turn, in my opinion. Cygnar ran his cavalry behind the forest as shown on the picture. Effectively taking them out of the game. One of the best mechanical players in my local gaming club, keeps telling everyone. - "While ahead in attrition, never assassinat". With scenario play in mind, I tried to keep going to attrition. Taking away all the pieces that can kill Helios, equals me winning on scenario in the end, at least thats what I keep telling myself. I moved my damaged Chimera down to get repaired. The second Chimera walked up in telekinesis range of the Charger. Then Rahn telekinesis the Charger, then the Chimera closer the Centurion, to put him in range of the third telekinesis cast, and put the Centurion in range og walking distance of Helios. The Sphinx moves up to shoot the Charger, giving my mages extra range. 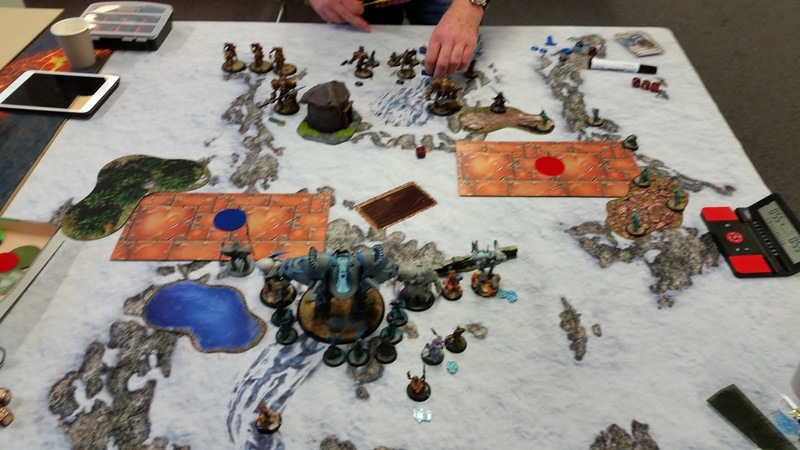 The mages proceed to pull the Charger into charge range of the second Sphinx. Helios moves up shooting Centurion, moving him into melee with Helios. Then shoots Reinholdt out of range of Cain. Helois kills the Centurion, and the Sphinx takes care of the Charger. 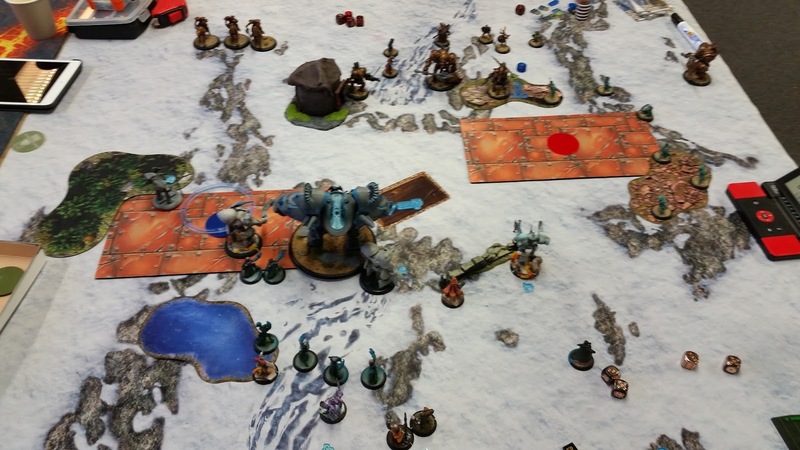 Cygnar takes another control point. I feel that this turn went according to my plans. Leaving Cain between a rock and a very hard place. He has to feat, hoping to kill Helios. Leaving me with two heavys in range of him, and Rahn feat still alive. 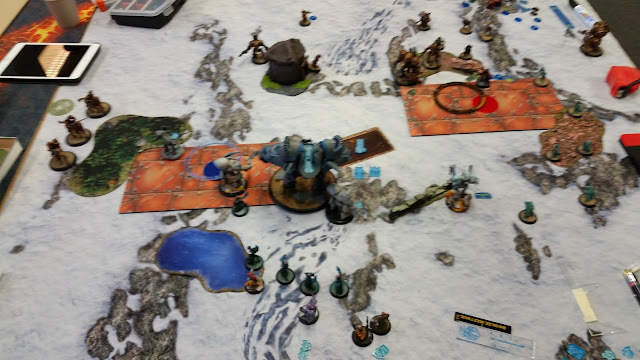 Cygnar scores his third control point. With two Centurions, and a Charger down. Cygnar hasn't much they can do. Cygnar shuffles around, before feating, trying to kill Helios. 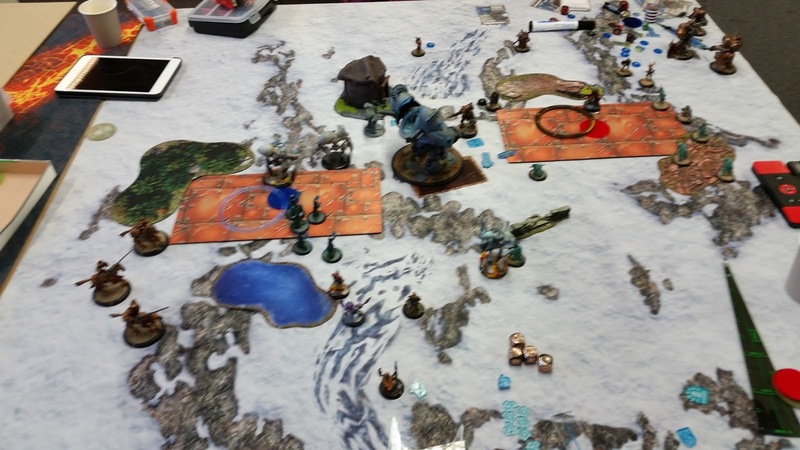 With Ace in melee, and Ragman right behind him, Cain is shooting with pow 14. His first roll was downright a miss. The result of rolling low on the damage rolls the three first attacks, and not being able to get the third attack from Reinholdt left Helios alive with 17 boxes. Cain is left out in the open, behind a cloud. More importantly, he is standing there without heightened reflexes. This means I can knock him down! All my ideas about scenario play just flew out the window. It's hammer time! My second Chimera hasn't taken too much damage. Just his shield is down, so I hope he can take a free strike from Ragman. I take my chances and run him up between Ragman and Ace, into the cloud. Sylys gives Rahn arcane secrets, Rahn feats, casts telekinesis on Cain. Then forse hammers Cain into his own objective. Four damage dice for the slam, and Cain dies on that single roll. One of my main problems against Cain is how much work he can do himself. In my opponents list, there are a few problems to solve. Heavies and colossals, tho something you need to be wary of. Can be solved in an easy matter, but Chains threat ranges are super scary, especially when he can assassinate you without light of sight nor initial ranges. So keeping my infantry safe is very important, since it's the HSBM that deliver the punsh.